Free entertainment and G rated Film – Rio – will be screened in CB Smith Reserve in Fawkner on Friday 17 February 8pm onwards. Parking: in CB Smith Reserve car park (enter via service road gate), or why not walk or ride a bicycle? 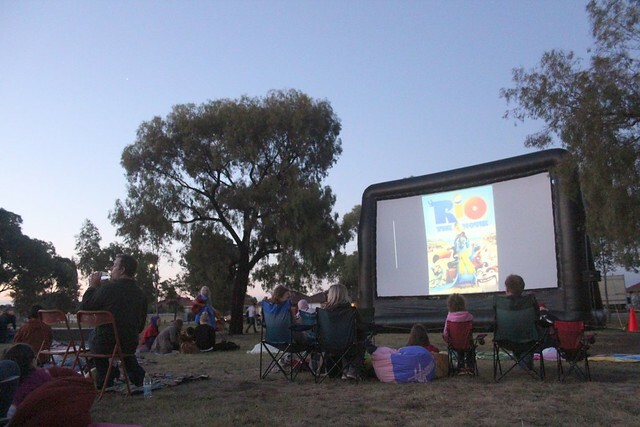 Movies in the park is a free community event presented by Moreland City Council for all the family. Bring a rug and picnic or join in with a free sausage sizzle as well as roving entertainment from 8 pm. The film Rio screens from nightfall (approximately 9 pm). Blu is a domesticated Macaw who never learned to fly. He enjoys a comfortable life with his owner and best friend Linda. Blu and Linda think he’s the last of his kind, but when they learn about another macaw who lives in Rio de Janeiro, they head to the exotic city to find Jewel, Blu’s female counterpart. Not long after they arrive, Blu and Jewel are kidnapped by a group of bungling animal smugglers. Blu escapes, aided by the street smart Jewel and a group of wisecracking and smooth-talking city birds. Now, with his new friends by his side, Blu will have to find the courage to learn to fly, thwart the kidnappers who are hot on their trail, and return to Linda. Interested in the History of Fawkner?